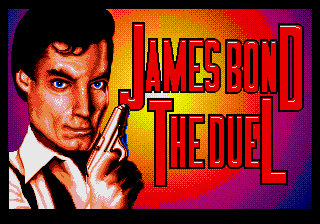 James Bond 007: The Duel, called 007 Shitou: The Duel or just 007 Shitou (００７・死闘) in Japan, is a 1993 game by Domark and The Kremlin for the Sega Mega Drive, Sega Master System and Sega Game Gear made with the James Bond film license. While they share the same theme, the Sega Mega Drive version has completely different stage layouts from the Sega Master System and Sega Game Gear versions. The Game Gear version of the game was only released in Europe, though there was a May 1993 planned released for the United States. The goal of each mission is to do whatever it says on the top left corner of the screen; for example, rescuing girls, finding bombs, etc.. / jumps, / shoots your gun, and (no equivalent on SMS/GG) launches a grenade (which you have a limited supply of. Simply touch a grenade to take it; simply touch a girl to rescue her. The game has a rather realistic physics system, giving the player a feeling of weight and impact. Falling from high places results in instant death. The Sega Mega Drive version is very short with only 4 regular stages and a final boss confrontation stage. There are three difficulty levels to pick from, but they only influence the amount of damage received from enemy bullets. The game also has certain small technical flaws, like being unable to shoot downwards without firing a straight bullet first. Main article: James Bond 007: The Duel/Magazine articles.